"If you spell 'cow' inside a cupcake, can a vegetarian eat it?" Ally needs to write a page about herself for the new teacher but she is reluctant to do it. Ally thought a bright card with yellow flowers will be beautiful enough to make Mrs. Hall smile at her baby shower party but Ally never expects she had sent a sympathy card instead. In seven different schools for seven years, Ally always has her ways to avoid to do anything which reveals her inability to read by creating distractions. When Mrs. Silver tries to talk to her to understand her reason for sending the card, Ally just stays quiet. Afterall, how can you cure dumb? Ally wants to apologize to Mrs. Hall but the words just can't come out of her mouth and she punishes herself by walking back home. Ally's mother works in a restaurant as a waitress. They frequently move to different places since Ally's father is a military officer. Ally has a brother named Tavis who wishes to have his own restoration shop in the future. Despite one of Ally's teachers used to tell her mom that she is a slow learner but her mom always believes that she is good at math and a talented artist. Ally just feels tired that her mom will never understand her world no matter how she tries to explain to her. "When people have low expectations of you, you can sometimes use it to your advantage. As long as you don't have low expectations of yourself. You hear?" Ally's new teacher, Mr. Daniels seems is a funny teacher which makes Ally feels hopeful for her future life in the school. When Mr. Daniels reads her assignment, he wants to understand more about Ally. Ally says she likes math and arts but pretending that she knows how to read, she says writing is just boring for her. Mr. Daniels promises that she won't be sent to the office as often as before and will try his best to help her. When everyone is given a journal to expresses themselves, Ally draws a three-dimensional cube with black colour sides. She expects she will be corrected by Mr. Daniels but to her surprise, Mr. Daniels just asking only a few questions about the drawing to understand more about her. There isn't a correction but instead, she feels her existence much appreciated by Mr. Daniels. Ally is assigned to sit beside Keisha and soon become friends. After acted being mean to Albert, she feels guilty and apologizes although he doesn't really bother about any teases. Soon Albert joins them for lunch and becomes their best friend as well. When they are having ice-cream after school, Ally tells them what she did to Shay last year which causes Shay being mean to her all the time. "Well...alone is a way to be. It's being by yourself with no one else around. And it can be good or bad. And it can be a choice. When my mom and brother are both working, I'm alone, but I don't mind it." "But being lonely is never a choice. It's not about who is with you or not. You can feel lonely when you're alone, but the worst kind of lonely is when you're in a room full of people, but you're still alone. Or you feel like you are, anyway." Ally wins the poetry award in her class. She feels happy at the beginning but later she feels it's more of a pity award. "Imagine if every single time you got on your bike, you had to worry that the wheels would come off. And every time you ride, they do. But you still have to ride. Every day. And then you have to watch everyone watch you as the bike goes to pieces underneath you. With everyone thinking that it's your fault and you're the worst bike rider in the world." Ally feels sad because she really wants to fit in but Keisha encourages her to be stand out and not to bother what people think about her. "You're talking like a fool saying I don't understand what it's like to be different. But the thing is...I'm only different to the people who see with the wrong eyes. And I don't care what people like that think." "One thing's for sure. We're not gonna fit in, but we're gonna stand out. All three of us. You wait and see. You're going to be a famous artist and Albert is going to cure cancer or invent talking fish or something." During the class trip to Noah Webster House, Shay makes fun of Ally. Ally runs away from the museum and she sees a swing set which makes her misses her grandpa more. Mr. Daniels tries to understand and Ally accidentally blurts out that she can't read. Mr. Daniels tells her that she's different and smarter than a lot of other people. She is very talented in arts and possesses a very strong skill in creativity. Having difficulties to read doesn't mean she's dumb and he thinks the reason for her difficulties in reading is because she has dyslexia. He tells her that they will figure this out together to help her by giving some puzzles and games tests. "And you know what? You're brave." "Coming to school everyday day, knowing what you're in for. Knowing school will be hard. And that other kids are going to razz you. And you still come every day and decide that you're going to try again." "Now don't be so hard on yourself, okay? You know, a wise person once said, 'Everyone is smart in different ways. But if you judge a fish on its ability to climb a tree, it will spend its whole life thinking that it's stupid.'" An election of the class president will be held and Shay is the only candidate nominated by her friend, Jessica. With the intention to humiliate Ally, Shay nominates Ally to be her competitor. There is a speech needs to be given by the nominees on the next day. Ally is struggling to read what she wrote and decides to get rid of the paper and just be herself. To her surprise, most of the students in the class vote for her and she becomes the class president. One day, when Ally, Albert, and Keisha are walking home, a group of boys who often bullies Albert approaches them. Albert never fights back all these time and believes that violence is not a good solution to problems. However, when the group tries to push the girls, he fights back to protect his two best friends. Ally feels relieved after everyone knows about her situation. They feel curious and understanding at the same time. She is getting better in her reading and trying her best as she can with Mr. Daniels' help. She hopes Travis will be able to experience the same thing as her with the assistance of Mr. Daniels. "You say" - Albert adds and then pause to think - "that you'll grow up to be nobody. But logically...if nobody's perfect...well then, you must be perfect." 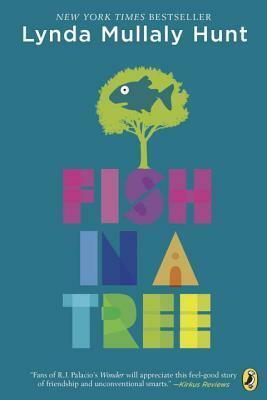 More reviews can be found on Goodreads: Fish in a Tree.